mississippi | Sophisticated Diva ~ A.K.A. Along came Polly! Welcome to Miche 12 deals of Christmas! 12 deals, 12 days, 12 dollars! Whether you’re shopping for additional gifts at a great value, or for something “just for you” – you’re in the right place! Just return every day through December 12th, to find out what other great specials are awaiting you! Starting with the $12 deal for Tuesday, December 2, we will be increasing the maximum per sale item to 10 per order. The maximum of 10 per order will remain in effect for the remaining 11 deals–and remember, shipping is FREE for online orders over $100 (exclusive of tax and any other code/coupon discount), so you may wish to snag several of these items each day for wonderful holiday gifts for neighbors, friends, family, teachers, and so much more! Be sure to share this change and choose to participate in the higher maximums. 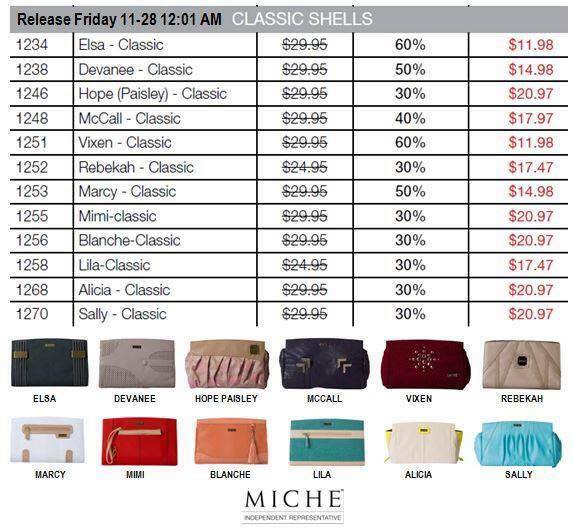 Your MICHE BLACK FRIDAY CYBER WEEKEND CYBER MONDAY SALES information!! UP TO 60% off!! Welcome to MICHE BLACK FRIDAY!! Here’s where you’ll see deals and STEALS at 12:01 am MOUNTAIN TIME and 4pm MOUNTAIN TIME every day over Black Friday and cyber Monday weekend. CLICK HERE daily to see the newest items, new items will be updated twice a day!! Please note, these items are WHILE THEY LAST only, and with prices like this—-you’ll find they go FAST, SO ….if there are MUST HAVES on your shopping list, and you want it, buy it, it may not last through the day (from previous experience, some items sell out almost immediately, so don’t let this happen to you!! What you see here, is ONLY DAY ONE—-SOME of these items will not be available until 4pm Mountain time, so check back!! You will want to make SURE you are in the system and can log into your account. If this occurs, please re-create a new account using an alternate email address. Field services will not be available to contact during this busy time to “reset” your account. There’s still time for that—– on Wednesday. If you get “stuck” and simply cannot sign in or place an order, don’t fret, GIVE ME A CALL. Polly 815-721-5549 (I will be awake, so don’t worry. I offer this personalized service to my customers!) I will be up all night going into black Friday weekend, and can submit your order! MICHE THROWBACK THURSDAY is HERE!! Delilah is a special shell, designed to “go anywhere” from the gym to the beach! It’s springy! It’s cheerful! It’s bold! It’s you! The Delilah Go-Anywhere Shell for Prima Bags is the ultimate in storage and convenience, and it looks amazing too. 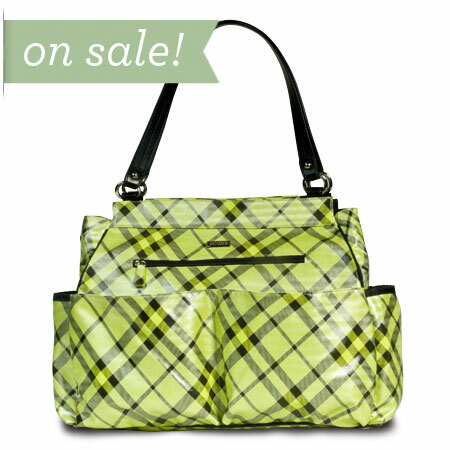 Brilliant lime green faux leather plaid material features one full-length, two oversized and two small pockets as well as a roomy zippered storage spaceall on the outside for super-easy access. It even comes with a matching diaper pad if you choose to use it as a diaper bag. CLICK HERE to view details and order this beauty, WHILE SUPPLIES LAST only!! Through 8am MT Friday June 6th! DON’T MISS OUT, on our specials for Father’s day, you can see them in the “new releases” album, get ONE m free with a purchase of $129!! 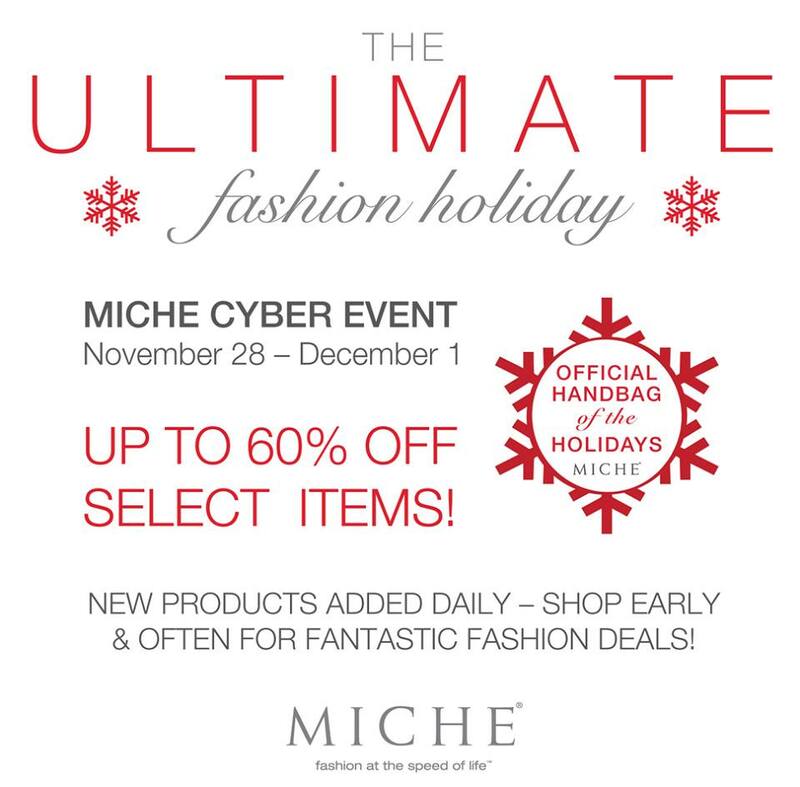 Miche Cyber weekend event~coming soon!! Miche Cyber Weekend begins November 29 and ends December 3. Details of the special offers will be announced soon! So stay tuned and keep checking back to get the latest information on the upcoming Miche Black Friday, Cyber Monday and Cyber Weekend Sales event! To be sure you get up to the minute details on Miche’s Cyber Weekend announcements, signup for our free newsletter and be informed about the details of Cyber Weekend Sales Event! Click here to signup! All sales and promotions will be LIVE on my website on November 29th!! CLICK HERE and BOOKMARK this page so you can get up to date availability!! The BEST way to handle any cyber sale is GET THERE FIRST and order fast! This is the same anywhere you go 🙂 Supplies may be limited, so make sure you are present and accounted for at the start of this spectacular sale! Order through Place your miche BLACK FRIDAY-CYBER MONDAY orders here! and you’ll be entered to win a free shell of your choice! Drawing will take place at the close of the show! Many customers have trouble with the website when trying to navigate, shop, and check out using Internet explorer. Also, when checking out—make sure you go all the way through the process (if you’re on a phone or ipad, you will have to scroll to do this) and click SUBMIT, until a “receipt” pops up on your screen. I have found from past experience that people get excited when they are getting a deal and don’t follow through all the way to the end of the process!!! 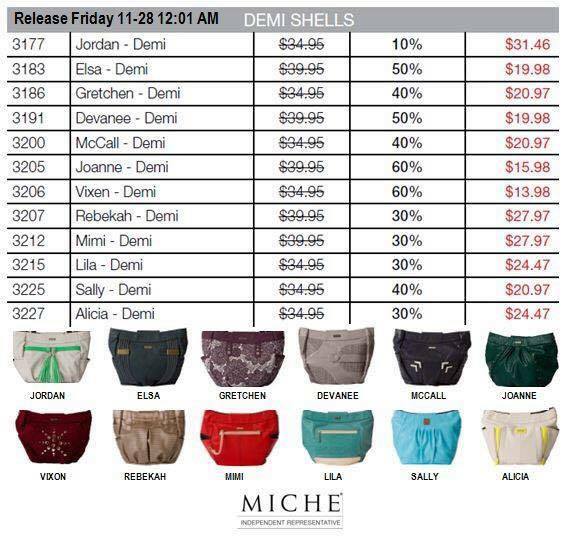 Miche free for fall continues!! FREE INTERCHANGEABLE CHAIN HANDLES **W/purchase of “getting started” package! The new October line of Miche shells—INCLUDING HOPE shells and the beautiful HOPE bracelet are now available to order via my personal website!! With any October Getting-Started Bundle purchase customers not only get a Base and two stylish Shells, but they also receive a set of FREE Interchangeable Handles to customize their look even further. Free for Fall continues and so do the great deals! ∙ Simply enter the Getting-Started Bundle items as you always do (Base + 2 Shells of the same size). IMPORTANT NOTE: There will not be a pop-up directing customers to add the Interchangeable Handles. ∙ Add Interchangeable Handles (Antique Brass and Silver) –SKU 9454. 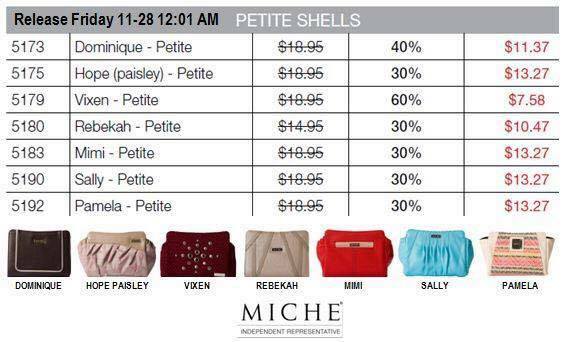 ∙ As with regular Getting-Started Bundles, Miche Luxe and Sale Shells are not included. ∙ Available on all order types. Bundle Prices are as follows – CLICK HERE to get started!! incentive to host a fall Party! SKU 9448H). These straps are not available for regular purchase until December 1. ∙ Starter Kits are only available to New Representatives. New Representatives also have the opportunity to earn up to $675 in FREE Miche during their first 90 days, join our $300 club to receive new releases early and at a discount, work towards earning a FREE trip to Hawaii, and many many other amazing perks! 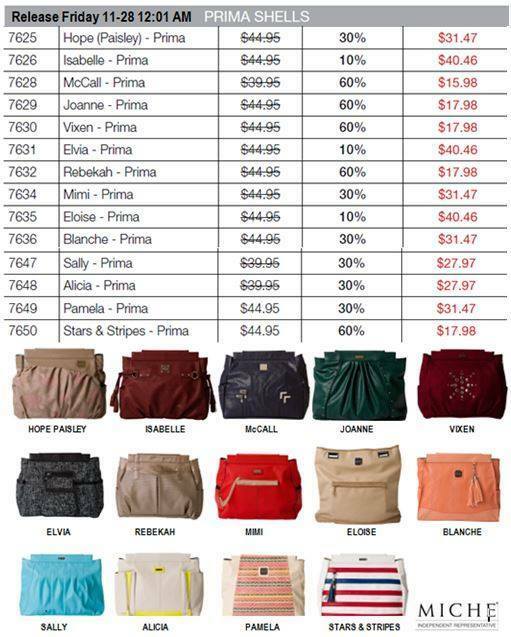 Miche spectacular BACK TO SCHOOL SALE!! fabulous Flash Promotion we call the Back-to-School Special! 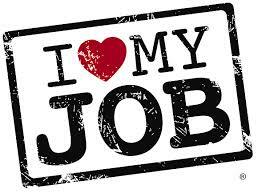 CLICK HERE to get started at 9am MT August 16th!!! 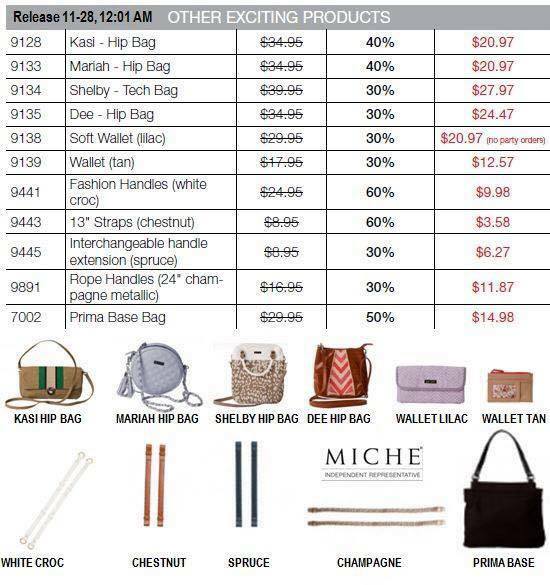 products (excludes tax and shipping) either online or as part of a Party order receive a FREE Base Bag of your choice!! When ordering online, there will be a prompt for you to make your selection! * The White Base Bag is expected to run out during the promotion and will no longer be available to order once it’s gone. *Get started with Miche and save. accessories, and get your Base Bag free! friend and gift them your free Base Bag.